The #1 Train Simulator for Mobile over 20 million+ downloads on Google Play! Train Sim is a 3D Train Simulator that allows you to drive over 50 a trains through 10 levels or create custom environments for your trains. Control speed, direction, sound horn and bell, control train lights, switch between night and day mode all with multiple camera angles. Watch as the train goes by from a station or sit inside a realist 3D cabin. I originally wrote Train Sim for my 18 month old son to satisfy his train obsession. After seeing how happy the game made him, he decided to publish Train Sim to the Google Play Store, for other parents & kids to enjoy. Within the first month of its release Train Sim was downloaded over 1,000,000 times on the Android platform, reaching the top 100 most popular Casual Games in Google Play. Although Train Sim originally started as a fun project it became the foundation for my company 3583 Bytes. Within the first month of its release Train Sim was downloaded over 1,000,000 times on the Android platform, reaching the top 100 most popular Casual Games in Google Play. Although Train Sim originally started as a fun project it has now became one of my favorite hobbies. Train Sim was written using Unity 3d a multi platform game engine that allows you to easily make games for Windows/Mac/Linux/Web Android and iOS. 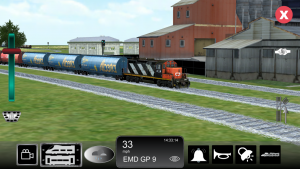 Train Sim is currently available for Android, iOS devices and Windows.